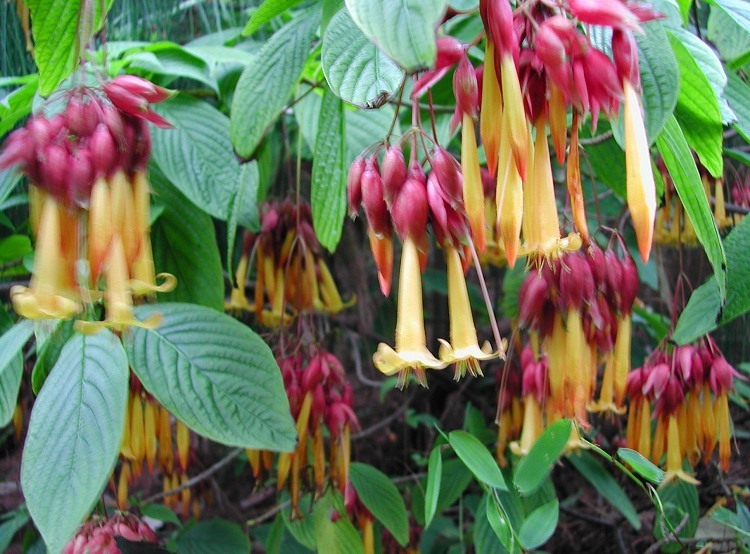 There's a story behind Deppea splendens. In 1973, botanist Dennis Breedlove discovered this eye-catching plant while trekking through the cool mountains of southern Mexico. It was a beautiful member of the coffee family, with rich, warm colors that almost seem to glow. 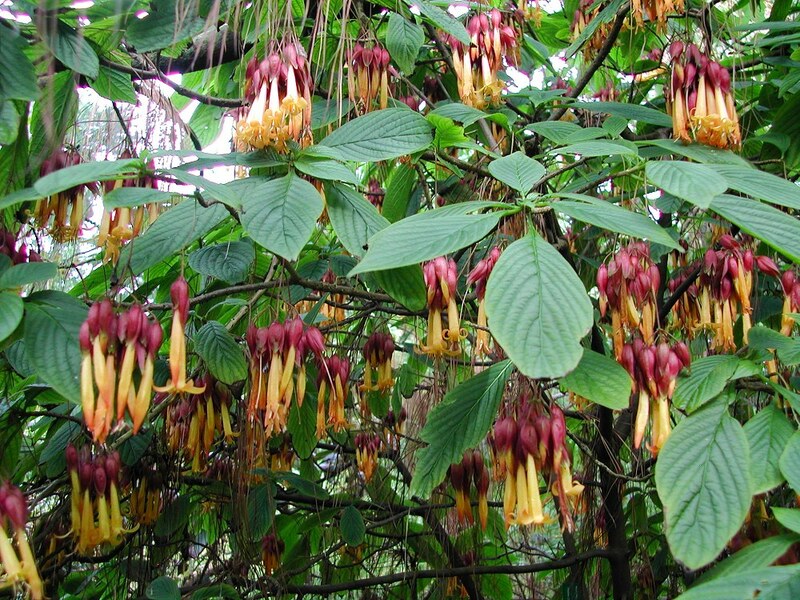 The plants were found nowhere else except a single location in the cool Mexican hills. When Breedlove returned to the site in 1986, the plants were gone - a victim of farmland development. The species is now believed to be extinct in the wild. Fortunately, Breedlove had saved some seeds of Deppea and grew them. Any existing plants of this species originated from those seeds. This is one of the rarest plants in cultivation today. 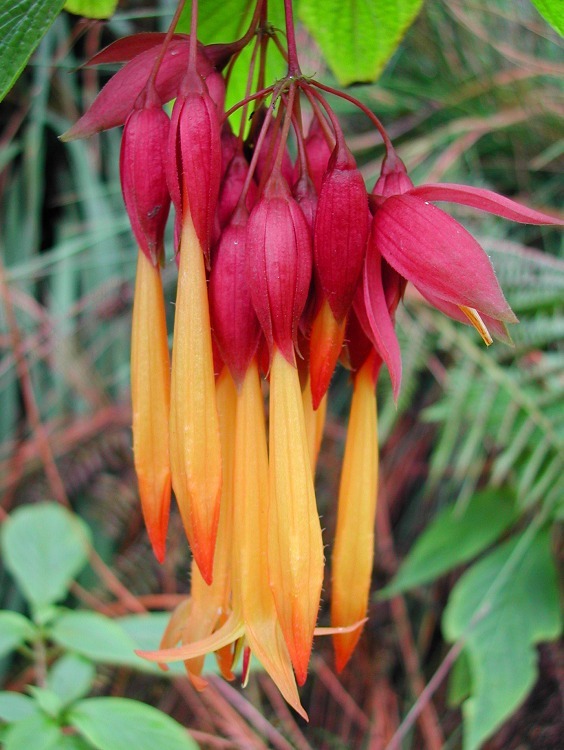 Deppea splendens is an evergreen bush that grows to about 10 feet tall here in San Francisco, although you may prune it to any size. The leaves grow in whorls of 3 and have an interesting, ribbed texture to them. It blooms in waves throughout the year and is a heavy bloomer. The 2½ inch blooms are mango or apricot in color, with a burgundy or wine-red calyx. The tips of the petals are sunset orange before they recurve gracefully. Each flower - and the entire cluster - is suspended by a long, wiry stem. It's amazing how such a thin strand can hold the flower bunches. This is a very elegant and beautiful species. Deppea needs frost-free conditions. I don't think it can survive more than a few degrees of frost. It comes from cool cloudforests, so it prefers moderate temperatures, cool nights, and some protection from strong afternoon sun. I don't know if it will thrive in consistently hot conditions, especially if nights are warm. It grows well in a pot and can be grown indoors. If you can provide the right conditions, you'll find it is easy and very rewarding. Unfortunately, fake Deppea seeds are being distributed from China. I guarantee that mine is the genuine Deppea! Complete tips for growing Deppea are here.